A binary counter is a chip designed to count the number of pulses or events that occur in digital circuits. These chips memorize the events and show the count of events at output port. The chip memorizes the event and shows the output in binary code, hence the name BINARY COUNTER. What binary counter does it each time a pulse is appeared at clock pin, it counts it and stores the value. We will discuss more on that in the working part. Here we are going to use a 12 bit binary counter. The counter chip is 74HCT4040. With a 12 bit binary counter, we can count events up to 4096 (2^12). So it would take 4096 clock pulses for the chip to reset itself to zero. Now the clock is provided with a button, so for every button press there will be a positive peak at the clock pin and hence an event. The binary counter has a capability to drive the LED directly so there is no need for resistors at the end of binary counters LEDS. 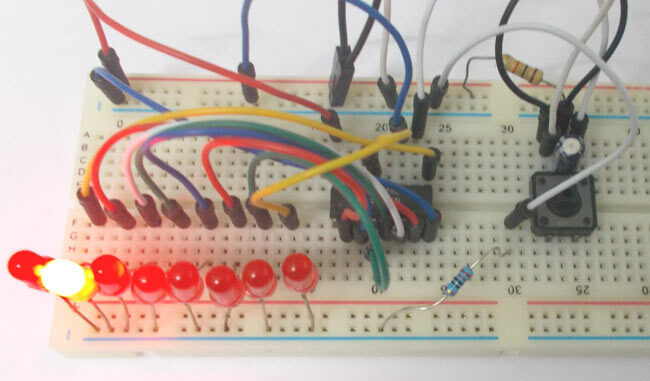 The MR (Master Reset) of binary counter must be pulled down at any time, leaving it open might cause unpredictable results at the LEDS might blink randomly. so every time a peak is passed the counter considers it as an event and increments the output by one for every passing event, once it reaches it limit to track the events it automatically resets to zero and starts again to count the pulses. And for the output it provides the event number as binary output through pins 9,7,6,5,3,2,4,13,12,14,15,1. In LSB (Least Significant Bit) to MSB (Most Significant Bit) fashion. so if the event count is 10 the pins (7(2^1=2),5(2^3=8)) will be high and so the corresponding LEDS glow. To reset the counter to zero under any stage connect the MR pin of counter to +5V, this resets the counter to zero.